The next Mortal Kombat is going deep. Not just in the 'show you highly detailed internal organs' kind of way, either. 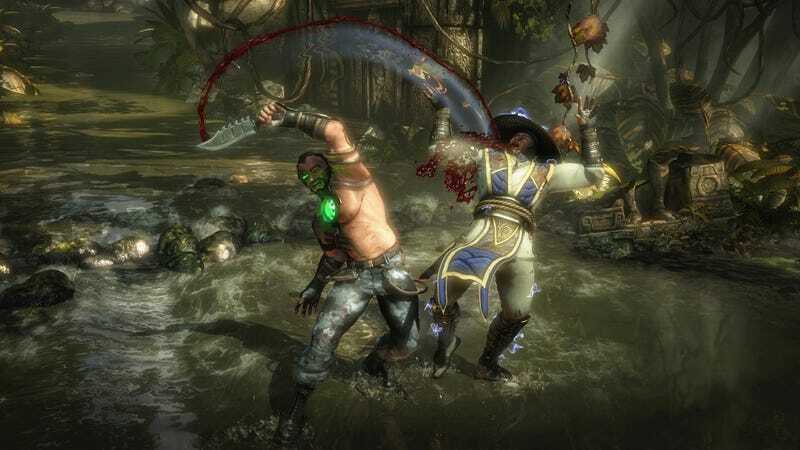 The newly announced Variations feature and other tweaks in Mortal Kombat X are going to give players other layers of options for how they beat each other up. As previously detailed, players will be able to choose a variation for their Kombatant at the character select screen. Each one makes tweaks to movement, attacks and other aspects of the character in question. When I got my hands on the game at PAX Prime today, I played with variations for several different martial artists. A go-round with Scorpion in one variation revealed new moves that summons a minion from hell to hold enemies in place from the ground or attack from the air with a dive kick. With his Master of Storms variation chosen, Raiden can set up floating chains of lightning that make attacking a lot harder. In each case, the matches wound up feeling a lot different since spacing and certain preferred strategies may not work any more. In some cases, a variation will change the nature of a move, making it hit harder or stun longer. In other cases, the same input will result in an entirely different move between variations. One thing I asked associate producer Trevor Traub was when you'd be able to change variations. Say you wanted to switch things up in Ladder Mode. In cases like that, Traub said that you'd be locked into a particular variation until you go back to the character select screen. Another change to MKX's fighting is the dash meter, which sets a limit to the amount of times a character can quickly sprint towards and away from an opponent. At the center of the screen is an icon with two segments. When they're full, you can dash twice. When empty, you need to wait for them automatically refill. Speaking of meters, the X-Ray meters from MK9 are returning. As before, you can unleash devastating cinematic attacks when they're filled all the way. Of course, the X-Ray move pale in comparison to the series' signature fatalities. During my chunk of time with the game, I pulled off a few of the lethal finishing moves. For new partner characters Femm and Torr, the smaller character gets thrown at the stunned loser's head claws first and flips over, sliding and slicing her way back down to the ground. Then hulking brute Torr steps up and tears the loser's body in half lengthwise. A new Sub-Zero fatality has him throwing a spiky ice blast at the loser's mid-section, freezing it. He then shatters it, opening up the torso front and back. The frostyninja then reaches in, breaks his opponent's spine and rips the body apart. Fatalities have always been morbidly humorous and it was Cassie Cage's kill move that made me snicker the most. The daughter of Johnny Cage and Sonya Blade is apparently a special ops government agent like her mom and her Fatality starts with her shooting out the loser's knees. When the beaten Kombatant drops to their knees, they get another bullet right in the middle of the forehead, which shoots out a stream of blood. For the last touch, Cassie takes out her bubblegum and plugs the bullet hole, resulting in a little blood-red bubble that quickly pops. Messed up, no? This early PS4 build of MKX felt fast and fun to play, with the environmental interactions dev studio Netherrealm put in Injustice as another new addition. All together, these various features make Mortal Kombat X feel like it's going to enable a lot of different approaches to its core fighting.